In July I had the privilege of spending 10 days teaching a workshop on information fluency in classical studies at the Center for Hellenic Studies in Washington DC. It was an incredible luxury to explore a topic in such depth, when in the past I have had at most an hour and a half to reach a group of students! I am very grateful to Kenny Morrell, who invited me to teach this class; Lanah Koelle, our program coordinator/librarian who contributed her expertise at every stage; Allie Marby, CHS’s summer interns, and librarians Temple Wright and Erika Bainbridge, who attended sessions and supported us at CHS, especially in the library; and most especially the workshop students, who gracefully accepted their role as guinea pigs and taught me a great deal. The students were a mixture on American undergraduates and Greek professionals in education and information fields; each brought an inquisitive spirit and their collective hard work and openness to sharing and new ideas was a major factor in the success of the workshop. Thank you! As a group we assembled some resources that others who are interested in this topic may find useful. The first is a Zotero group library with folders that list the session topics. Each folder’s contents include citations for assigned readings for the session (usually fairly short, web-based readings) and citations for information resources we discussed during the session. The students were asked to complete two assignments. The first, the development of an annotated bibliography, is available as a Google document: https://docs.google.com/document/d/1cXaPqTDdOUIzI6E26SZiOFjb7a7BMzczWOfh8qXVSJc/. The second, a WordPress Research Guide, is also described in a Google document (https://docs.google.com/document/d/1O3Rm8yXGlhIRPJh3PrDiMgiAgH0LiHhC44mSvq_9QNk/) and the guide itself is available via the CHS’s website. The guide should be viewed as a work in progress; we began a project that we hope to flesh out with the participants of future workshops in years to come. Librarians and scholars interested in libraries and archives in Greece will be delighted by Maria Konstantopoulou’s entry on this topic; Latin teachers can find many fun texts to use with beginning students in George Trapalis’ entry; Matina Goga has assembled a list of valuable links for the study of Greek society and culture; Brittany Profitt has done the same for Roman society and culture; teachers of Greek might want to think about using Tyler Verity’s entry on precisely defining words for a classroom exercise; Ashton Murphy’s entry on reading for research addresses study skills faculty may assume undergraduates possess when they arrive at college; and Vanessa Felso’s entry on latin dictionary resources is a model of clarity, useful for any undergraduate. Use them, and share them! If you can get through one of Miss Lang’s Greek classes, you know that with a similar level of strategic planning, determination, and hard work you can write a book, you can survive in the wilderness, you can save a historic house from demolition, you can fix the plumbing, you can win an election, you can run your own business — whatever you want to do. In fact all that will probably be easier than the Greek was. The fact is that by believing in our abilities so firmly Miss Lang caused us to have those abilities in the rest of our lives, and that is the most amazing gift that a teacher can offer. From a talk by Eleanor Dickey, at the memorial service for Mabel Lang, April 3 2011, Bryn Mawr College. We’re halfway through the INTENSIVE introductory Greek class I am working with this summer, using Kindles as a supplement to the textbook and as a little experiment to see what resources work on them. I did a big background round-up of digital texts for Greek in a post a bit ago, and more recently I wrote a little guide to using the Kindles for the students as well. We decided to ask them to purchase a koine Bible from Amazon, for $2, and we’re doing daily sight-reading from John as a warm-up. We chose this version because it has an accurate text, with breathing marks and accents (many digital koine texts omit these), and as a bonus it includes the Septuagint and Apocrypha as well. The professor has also made her personal supplementary notes to the textbook (UGA uses Athenaze) available to the students in .pdf, and has placed additional readings in the course management system (UGA uses eLearning Commons) .pdf as well. I learned a little more about the nexus of file types, the Kindle, and Greek fonts as we got the class started. There are two ways to read a .pdf or .doc file on the Kindle. You can read the text in its native format, as a .pdf or .doc, in which case you see the text just as it looks on your computer screen, but it’s tiny, because it fills the Kindle screen which is quite small. Or you can convert the text to a Kindle format, by emailing it through the Kindle email account and using the word “convert” in the title of your email. Unfortunately this messes with the formatting a bit, especially if there are tables in the original document, and for this class the documents did contain tables – very natural, when setting out paradigms! We also had troubles with the Greek coming through okay, especially if we converted .pdf files. The Kindle v. 3 (small grey one) fully supports Unicode, unlike previous Kindles, but it seems like .pdfs do not necessarily support Unicode Greek. So, the students in our experiment have straight .pdf files on their Kindles, with very small type, but they are young and hardy – they’ll survive! A great digital tool for flash cards that unfortunately doesn’t work on the Kindle is Anki software. It’s free to download to yous computer, and there is an iPod app but it apparently costs $25, and so far none of the students has seemed willing to pay that much. Once I had the software installed in the computer, I searched for Athenaze in the set of existing flashcard decks and found a deck of cards for the first 6 chapters. The program gives you a vocab flash card, and you can show yourself the answer when you’re ready and then rate how soon you need to see this card again – from “immediately” for things you don’t know at all, to “never” for stuff that’s deeply in your brain. I have long agreed with Richard Larson who wrote way back in 1982 that the research paper as taught in college is an artificial genre, one that works at cross-purposes to actually developing respect for evidence-based reasoning, a measured appreciation for negotiating ideas that are in conflict, or original thought. I hate it when students who have hit on a novel and interesting way of looking at an issue tell me they have to change their topic because they can’t find sources that say exactly what they plan to say. I try to persuade them otherwise, but they believe that original ideas are not allowed in “research.” How messed up is that? The other and, sadly, more frequent reference desk winch-making moment involves a student needing help finding sources for a paper he’s already written. Most commonly, students pull together a bunch of sources, many of which they barely understand on a topic they know little about, and do their best to mash the contents up into the required number of pages. I don’t think the blame is to be placed on the research paper as an assignment, but I do think many undergraduates need a lot of support along the way if they are to write good research papers. Finding a workable thesis, finding and understanding appropriate scholarly sources, and writing a competent argument are discrete tasks that each require multiple skills; I have trouble covering just the research piece in an hour-long library instruction session. I do think there are valuable assignments at the undergraduate and even graduate levels that help teach many research paper skills without technically being research papers. In one undergraduate class, I was assigned several papers where the topic was a question, required to be used as the title of the (short) paper and answered within it, using scholarly sources which I had to find. In another, we were given a controversial topic and a short bibliography of scholarly sources with contrasting viewpoints and required to write a paper assessing the strengths and weaknesses of the arguments. These types of assignment help teach some of the skills that a research paper does – analysis, critical thinking, and writing a persuasive argument. Other assignments could be devised to focus more specifically on the thesis-development and research and source evaluation pieces. While I have seen many students struggle with research papers, I don’t think the answer is to eliminate the research paper at the college level. I think every college graduate should be able to produce a competent 10-page paper. But I do agree that many undergraduates do not arrive in college with the skills necessary to do this, and we should be teaching them these skills in a systematic way, and not just throwing them into the process and watching them struggle. A scholarly e-book repository, it includes most out-of-copyright works (pre-1923) digitized by Google Books, plus additional titles post-1923 where Hathi staff have worked with publishers and authors to make works available to the public. Search interface is very much like a library online catalog, so it’s easier to find a known title than when searching Google Books. Note one can create a free account and make lists (“public collections“) of texts. It would be useful to have such a list for important classical works, no? Maybe in my copious free time (or yours). An alphabetical list of works selected by Crane and Babeu – Google Books Ancient Greek and Latin Texts Available as downloadable .pdf files. Ditto, but US-access only. Requires a Google account to log in, and you must be in the US. You can also search Google Books for specific titles, but good luck getting what you want in the first page of results – I’d try Hathi Trust first, myself, as the search interface is more sophisticated. Requires creation of an account (free), after which one can download .pdf files. Includes out-of-copyright texts – this site dates to 2001, so the texts were hand-scanned before the advent of Google Books. Greek texts library. There’s also Latin. Best website name ever? Links to downloadable .pdf versions of out-of-copyright editions from the Loeb Classical Libraries. Can filter by language – Greek includes modern and ancient; Latin is available as well. Very limited number of titles, but many of those that are available don’t need any conversion to be read on a Kindle. Examples: Cicero’s Tusculan Disputations, Περί Ψυχής by Aristotle. For purchase at Amazon (prices listed – they are generally modest). In general, unless you are searching for a known item, it’s hard to find Greek texts or texts on a subject. I found a lot more inexpensive resources for Koine Greek than classical – presumably the market is stronger for people who want to read the Bible in the original than for people who want to read Thucydides. One problem I have run into is that the Kindle cannot convert any documents larger than 25MB, and many .pdf files are larger than this. The solution is to use Adobe Acrobat and break up the .pdf files into smaller units, which requires a) possession of Adobe Acrobat (the production software, not just the reader) and b) more work on the user end – a lexicon that’s divided into several chunks alphabetically is not as easy to use. At lunch we had “dork shorts” which were timed 3-minute talks on anything anybody wanted to show. Topics included a documentary about an Atlanta punk band, a blog about rural life which featured a lovely photo of a ca. 1940 man with his pet skunk, and UGA’s <emma> program, used in writing classes, which allows collaborative markup of student papers. After lunch 3: Crowdsourcing Digital Humanities Projects; I was hosting again. I was hoping to get advice on how to manage the human side of a project like the Ancient World Open Bibliographies. I was struck by the great diversity of experiences and expertise present at this session. Participants talked about: a women’s collective project in India, crowdsourcing the transcription of the Cardinal Newman letters at Emory (interestingly, the volunteers were not collected using the internet, but came mostly via newsletters and news articles), open-access software projects, and a project to collaboratively write a latin textbook. We talked about the importance of passion in volunteers (which is why there’s a Wookieepedia) – and how it can’t be artificially created – and, failing passion, the need to “make it fun” or even sneak crowdsourcing into a project (like ReCaptcha). By this point someone in another session was beginning to tweet about zombies, so the UGA contingent regrouped and headed back to Athens. I don’t know how anyone had the energy to go out, but gather some THATCampers continued conversations into the evening. THATCamps are “unconferences” – that is, there is no set agenda and no pre-planned papers. The conference attendees post at the conference web site about what issues they want to discuss, and start to generate interest, and then the morning of the first day they write their sessions on a huge whiteboard and others make tickmarks if they plan to attend. 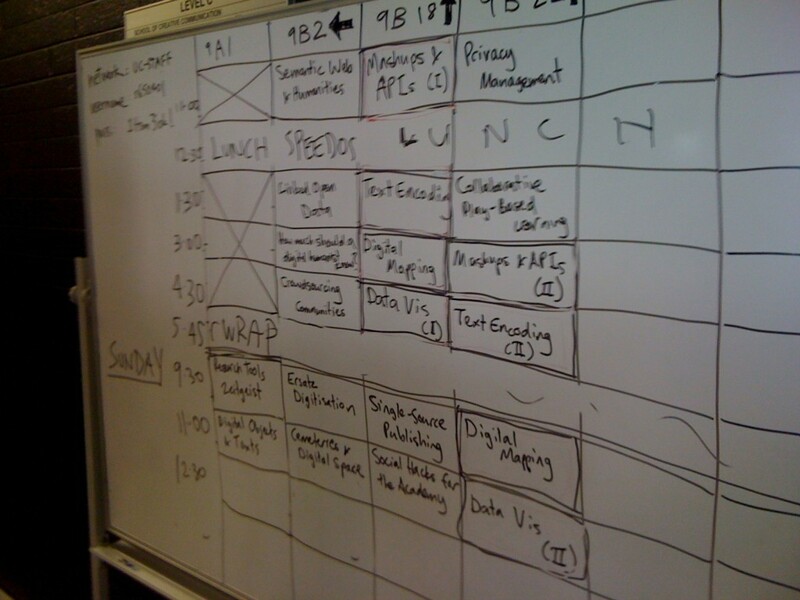 This is actually from a THATCamp in Australia. Hence the appearance of "speedos." The tickmarks allow the organizers to assign sessions to appropriate sized rooms. We had a brief rundown of the THATCamp groundrules (below) and we were off. THATCamp is FUN – That means no reading papers, no powerpoint presentations, no extended project demos, and especially no grandstanding. THATCamp is PRODUCTIVE – Following from the no papers rule, we’re not here to listen and be listened to. We’re here to work, to participate actively. It is our sincere hope that you use today to solve a problem, start a new project, reinvigorate an old one, write some code, write a blog post, cure your writer’s block, forge a new collaboration, or whatever else stands for real results by your definition. We [are] here to get stuff done. Most of all, THATCamp is COLLEGIAL – Everyone should feel equally free to participate and everyone should let everyone else feel equally free to participate. You are not students and professors, management and staff here at THATCamp. At most conferences, the game we play is one in which I, the speaker, try desperately to prove to you how smart I am, and you, the audience member, tries desperately in the question and answer period to show how stupid I am by comparison. Not here. At THATCamp we’re here to be supportive of one another as we all struggle with the challenges and opportunities of incorporating technology in our work, departments, disciplines, and humanist missions. So no nitpicking, no tweckling, no petty BS. digital libraries/archives session theme of missed connections: who is mediating between resources and researchers/teachers? For me, this was a stand-up moment: I am. In my work as a Reference librarian, I am doing this for students who walk up to the desk or ask me a question via chat reference. In my work as a subject liaison, I want to make it my goal to do this, not just for the faculty at my institution, but for the discipline of classics as a whole, at this blog. I’ve struggled with understanding digital humanities projects so I can explain to the average classicist – what is this, and how might it be relevant to your research or teaching? Is there an undergraduate assignment lurking in this project? Some practical ideas for digital collections or dh projects that we discussed were educator guides, sample assignments, or digital “sandboxes” for playing with content, all hosted at the project sites. These can come from the librarian or project head, but project hosts would also welcome feedback from scholars who use their collections: email the project letting them know your students used the materials, and what the assignment looked like, or noting access hurdles and making suggestions to overcome them. For faculty, the takeaway should be that digital collection and project hosts want the materials to be used, and need your help to see how that can be accomplished most profitably.